PoolTown and Doughboy understand that there are many choices to consider in today’s above-ground pool market. That’s why we want to help you become a more informed buyer. Doughboy pools are the single most adaptable pools on the market today. 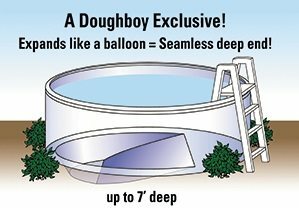 Whether you want an above-ground pool or an in-ground look, Doughboy has the answer! Doughboy pool’s unparalleled strength and quality are unmatched in the industry. Doughboy invented the first portable pool over 60 years ago and PoolTown has been an extremely proud dealer since 1960. Since then it has been our goal to give our consumers peace of mind about the longevity, maintenance, and safety of a Doughboy pool. With Doughboy, your choice between the two are equal. Doughboy pool frames are designed to last, whether they are made from steel or resin. The only choice you will need to make is deciding which of our beautifully designed pools you want in your backyard. 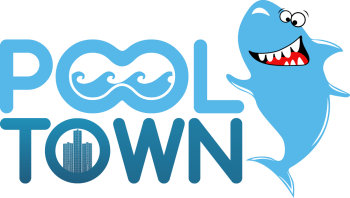 At PoolTown and Doughboy, we know the number one reason people buy a pool is to make memories – so we build our pools to last for a “Lifetime of Memories”. Our top-of-the-line pools are under warranty for the entire time you own them! 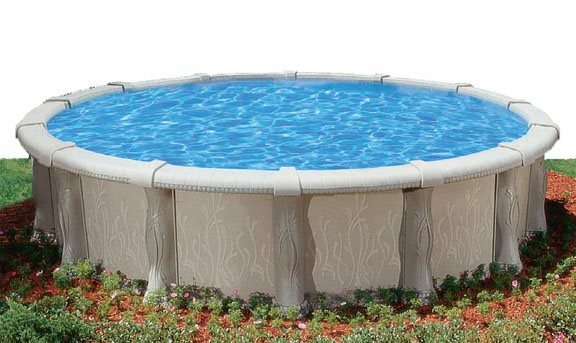 PoolTown offers an excellent assortment of Doughboy pool sizes in both round and oval configurations to perfectly compliment your backyard. Be assured that when we give you a pool dimension it is a “true” size based on the inside pool wall. Our pools also have a “true” vertical and top rail measurement. These dimensions are measured by a straight vertical dimension – not a wrap-around measurement of the rail. For example, a 24' round Doughboy pool has an actual swimming area of 24'. The competitions 24' round, who uses the wrap-around measurement of the top rail, actual swimming area may be only 22' depending on the width of the top rail. DON'T GET TRICKED!!!! Made from heavier copper bearing steel than industry standards for a stronger pool wall. Ours are 30-60 lbs. heavier than other brands. Be sure to ask the competitors what the weight of their pool wall is. You'll be shocked what they tell you!! Unlike our competitors, we do not use unattractive nuts and bolts that weaken the wall structure. Not only do the nuts and bolts weaken the wall structure, they also cause the much thinner liner they provide you with to puncture prematurely. Doughboy vertical end caps are made from 18 gauge galvanized steel – 50% heavier than most brands. This provides added stability at the base and the top of the pool. Ask to see our Doughboy vertical end caps so that you can compare them to the competitions vertical end cap. They are not even in the same league!! Exact, pre-punched holes assure structural integrity and allow for a more precise installation. The competition uses slotted holes which cost less to produce but weaken the stability of their pools. Test and compare us to other brands by vigorously shaking the top rail. You can feel the stability! Count the number of verticals and top rails and compare – we provide more than any other brand – increasing the strength and lifetime performance! The verticals on a Doughboy are spread out 48" where the competition can be anywhere up to 56" in between the verticals. The less amount of verticals on the pool, the less strength the pool structure has. Be sure to ask the competition so you can compare!! Com-Pac II™ Oval Support System with steel construction that offers a stylish, one-part tapered design that only exposes 9"of the support for a more attractive appearance. This helps accommodate larger pool models in smaller backyards. Many of our competitors do not utilize a "spa saver system" and the oval supports extend out 33.5". We like to call these "ANKLE BREAKERS" and its ancient technology. Have an exclusive vacuum port built into their faceplate enabling direct hookup of vacuums! Other skimmers connect over the top rail or through a separate plate that is near the water’s surface. Their design can draw in air that can cause the pump to fail! Be sure to ask your PoolTown pool specialist to show you the difference between the two. I think you'll agree that the Doughboy system is 1000 times better. All Doughboy liners exceed industry standards for weight and thickness assuring our liners will out perform our competition. Our liners are a “True Mil” measure. Don’t be confused by the “gauge” game our competitors play. Some will call their liner 20 gauge or 20 weight when they really measure only 15 Mil (.015”) in thickness or less. For example, a 20 Mil 18' round Doughboy liner weighs approximately 73lbs and a 20 gauge 18' round competitors liner weighs approximately 41.5lbs. Be sure to ask to see the weights!! 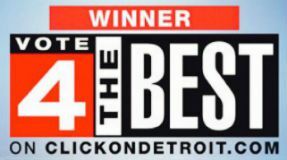 Dont get tricked by the competition into purchasing something which will not hold up long in our Michigan climate.